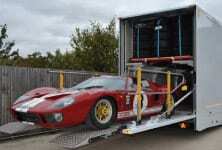 The Montracon box van has been a popular choice over the last 30 years. The in service data generated and fed back to the development team over this period being used to improve the design such that the van’s pedigree is now second to none. This experience coupled with its flexible production techniques means Montracon is ideally equipped to meet the needs of the smaller, specialist market box van requirements. Designed around calls from the pallet networks, the Montracon double-decker can be built incorporating numerous features that cover safer access to and from and manoeuvring along decks plus more efficient load retention/security. With ever increasing emphasis now being placed on Health and Safety and louder calls from operators for even safer operating conditions for their employees, its not surprising that Montracon leads the field when it comes to the introduction of features designed to help reduce the alarming number of avoidable accidents that occur. Whether its safer access to and from the trailer decks, more secure movement along the top deck or helping to secure loads both in transit and when curtains are drawn back, Montracon has listened to its customers and has acted. 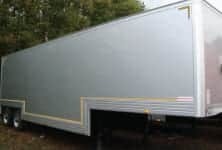 Rear door/tail lift arrangement designed to meet retail delivery requirement. 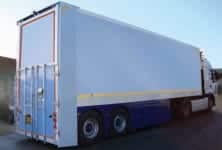 Our Specialist Trailers are designed to meet the specific needs of an outside broadcast provider. Designed to accommodate racing cars and crew, yet be low enough to access the pits via tunnels under the race track. 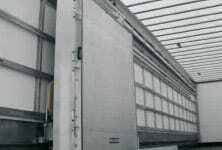 Internally installed lift, with fore/aft movement to ease loading and unloading capability.